Sinister 2, one of the creepier horror movies I’ve seen recently, is an attempt to make an even more sinister sequel to the 2012 horror-sleeper Sinister. (See below.) That earlier Sinister was a found-footage horror show that scared some audiences and grossed some dough back in 2012, and also inspired a lukewarm, semi-horrified response from, as Orson Welles was wont to say, your obedient servant. (See below.) But this new Sinister is, like many mediocre and derivative gorefests so unengagingly gory and so unentertainingly sicko that it seems extremely unlikely that we’ll ever see a “Sinister 3.” For which we should all be grateful. Returning from the earlier film is James Sansone as the unnamed small town deputy, referred to in the credits as Deputy So and So. So and So, in the last movie, discovered the source of all this sinister creepiness, lost his job and is now scouring the mean streets of small town Illinois as a private eye. He discovers that, as with most movie sequels, everything is happening all over again. Horrors! Evil ghost children, under the influence of actor Nick King as the vile predatory monster Bughuul (an H. P. Lovecraft sort of name, if ever I‘ve heard one), are prowling from house to house, setting up film festivals for the living children there, showing fuzzy old snuff movies on an antique projector (16mm probably), in which they kill their parents in various awful ways. They are apparently trying to brainwash the living children into likewise becoming homicidal maniacs and amateur moviemakers. Hawke, as Ellison, battled these young fiends and their hideous mentor, to no avail. Now, with Ethan Hawke out of the way, Deputy So and So has taken his place, trying to protect an abused wife and mother (Shanynn Sossamon as Courtney Collins), with vulnerable nine-year-old twins named Dylan (Michael Daniel Sloan) and Zach (Dartanian Sloan), all of them pursued by her rich, vicious and abusive husband Chris (Lea Coco). They all prowl around and occasionally watch movies where the subjects are being horribly murdered. Eventually, people get killed or find another movie. The photography is dingy. The script, which isn’t any good, was written by Sinister’s director-co-writer Scott Derrickson with co-writer C, Robert Cargill, and it was directed, dispiritedly, by Irishman Ciaran Foy (Citadel), who at least had the good taste not to recruit any bloodthirsty leprechauns to play maniacal ushers, brandishing bloody shillelaghs. I can’t honestly recommend the movie to anyone, except perhaps to maniacal fans of the first Sinister, or maybe a bloodthirsty, drunken leprechaun or two, or to various miscreants on the run from the law who want to hide out in the darkened theaters. There’s only one word for this movie, and that’s….So-and-so? Sinister? Don’t they wish. Sometimes genuinely scary, sometimes genuinely silly, director-co-writer Scott Derrickson’s Sinister is one of the more genuinely frightening uses of horrific found footage they’ve sprung on us recently. How much you enjoy it depends on how much disbelief you can suspend — which may depend on how many contemporary horror movies, especially the Blair Witch and Paranormal knockoffs, are on your regular movie-going diet. Derrickson tries to make the found footage — the supposedly amateur films the filmmakers show us — more effective this time, by mixing them up with supposedly “real life” stuff happening to the guy supposedly watching them. In what passes in Sinister for the real world, a struggling true-crime author named Ellison Oswalt (Ethan Hawke) moves his family into a house where another family not so long ago was massacred , without informing his own loved ones of their new home’s gruesome history or of the other murders (in other places) that preceded it. Meanwhile, Ellison keeps his most horrific discovery to himself : In the attic he finds scruffy old boxes containing amateur movies of the actual murders, taken, it seems, by the actual killer or killers. They provide, by far, the movie’s most disturbing moments. Eventually the rest of the family — Juliet Rylance as mom Tracy, and Claire Foley and Michael Hall Daddario as kids Ashley and Trevor — begin to show signs of paranormal wear and tear. The spooks, mostly dead and obnoxious children, play hide and seek and jump-behind-a-door with Ellison as he wanders around the place, and, as the dour local sheriff, played by Fred Dalton Thompson (perhaps contemplating another presidential bid), shows up and acts surly. Thompson’s deputy, played by James Sansone, is contrastingly helpful to Ellison, probably since he’s eager to get an acknowledgement in the eventual book Oswalt will write, if he survives. These supposed home snuff movies, which the filmmakers have created for Sinister are ultra-creepy and ragged-looking. The real life scenes are creepy stylized horror stuff. And the professional reality makes the amateur “reality” movies look spookier. (Creepy kudos to cinematographer Chris Norr for the way he lights both of them.) 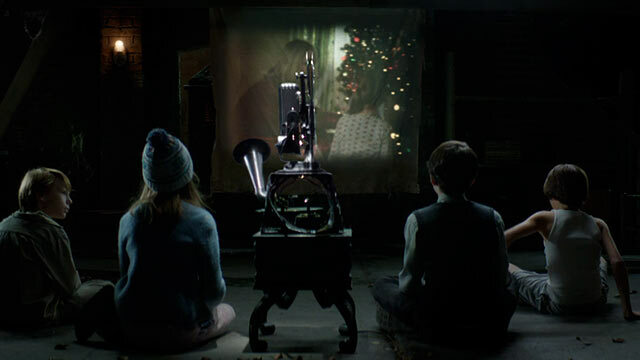 Derrickson, who also directed The Exorcism of Emily Rose and the overblown 2008 remake of The Day the Earth Stood Still, works with Norr to keep everything shadowy and grim and unsettling — never more so than when we see those home movie murders. Especially the one in the tree. Despite an effective falling-apart acting job by Hawke, you have to swallow a little too much malarkey to completely enjoy this movie. At least I did. Sheriff Thompson, whom I much prefer on old “Law and Order” reruns, probably has the right idea. Get out of town — or stay out of the attic — or don’t climb trees — or leave that found footage in its box, dammit.